Last night it was a full moon. This is one of the most sacred days in the Balinese Hindu calendar, as the moon is believed to be extremely powerful and magical. The Balinese celebrate this day every month by holding temple ceremonies and various other rituals. My family all went to our village to offer our prayers at our family temple. It was a very dark night, despite the full moon, and it was raining hard. It seemed everyone was on the roads, traveling to their various temples, dressed in the traditional white clothing. Parents and children piled on one motorbike, huddled together, trying to shield each other from the cold rain. It was a slow journey, which became even slower once we hit the village path. We were slipping from left to right as we tried to keep on the tiny concrete path. All I could think was thank goodness I am not driving! My husband managed to keep the car straight and we finally arrived at our destination. We bundled in to our house, trying to keep dry under an umbrella, but meanwhile our feet were squelching in the mud under foot. The flowers and fruit offerings had already been prepared by the villagers earlier in the day, and were all laid out ready for us as we stepped through the door. The priest arrived not long after, in his flowing white robes, and turban like structure on his head. He smiled his warm smile, and swiftly got down to business, blessing the house and temple area, ringing his little bell, and muttering mantras under his breath. As if by magic, the rain cleared, and we were able to stand out by the temple to receive our blessings from the priest. There are various rituals involved in this, none of which I completely understand, I just do as I am told. It starts with holding our hands palms up, while mantras are whispered and various sticks are passed over, we are then instructed to place our hands palm down, while more rituals are performed. A young coconut is produced and we are given three sips each. We offer up our prayers, holding various colored flowers, and finally, we are blessed with the holy water, and rice is placed on our heads, and flowers in our hair. All through the ritual, I am saying my own silent prayers to my own idea of God. This is what I appreciate about Balinese Hinduism. There are mantras, but there is also quiet time for us to create our own connection with the higher being. No preaching, just being. This works perfectly for me.I do not claim to be an expert, I only know what I have experienced, and observed. By the end of the whole procedure, a feeling of calm had settled on us, and we stayed a while, enjoying the calm of the village, before venturing back to the craziness of the city. It has been a long day, full of prayers and family, and we are all tired, but it feels good. I feel reassured that bapak is resting in peace. I kept catching glimpses of him in his son’s faces throughout the day, which seemed to be a sign that he wanted to reach out to let me know he was ok.
We arrived in the village at about 7pm last night, to find preparations in full swing. The women had been there all day, preparing the offerings and were leaving to go home, and the men were taking over, for the night shift. I went and chatted to all the different groups, making sure they knew how appreciative I was of the work they were doing, and then made my excuses and took the kids off to bed. At midnight we were woken for the first of many prayers. We stumbled to the bale dangin,(a small ceremonial building) where all the offerings were laid. This is where the dead body would have been too, but as we had already cremated bapak 8 months ago, there was no body. The whole structure was engulfed in smoke from hundreds of incense, and the priest was chanting in a lyrical voice. The whole family gathered and prayed, all the brothers and sisters had made the trip from various parts of Java and Lombok to be here for this send off. It felt wonderful to have them all there together; Muslims, Christians and Hindus all united in prayer for their deceased father. The energy was amazing, and as I looked from one to the other, I saw glimpses of their father staring back at me. He loved it when all his children were in one place, so he was clearly enjoying seeing them all there. We moved from the bale dangin to the grass area beside it, and were given a long piece of string to hold. On the string were hanging old Balinese coins, and each sibling had to hold on to one of the coins. The string was then set alight at one end, and as the fire reached each coin, it would drop off in to a bowl. 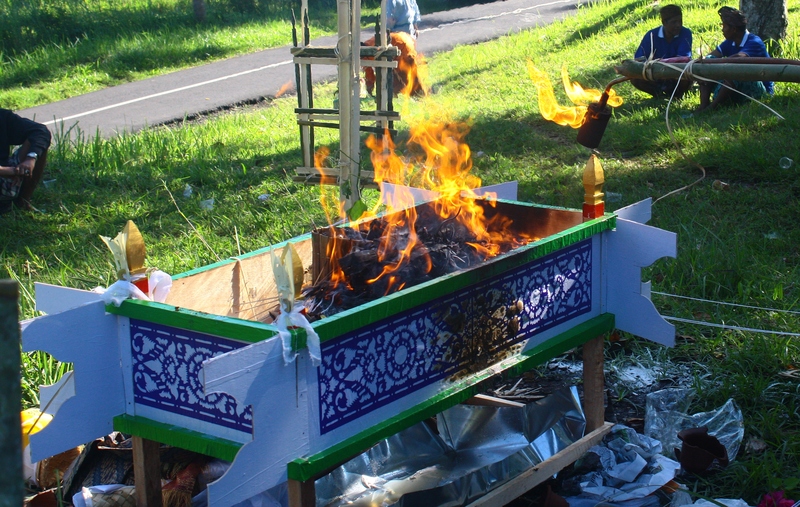 This was to symbolize cutting earthly ties with bapak, so that he could be free to go on to the after life. Once the whole string was burned, we were given an offering each, and told to turn around, and throw it up in the air behind us, much like a new bride throws a bouquet. This also represented letting bapak go free. After these rituals were over, it was around 2 in the morning. We filed back to bed for a couple of hours, before being woken at 5am to continue with the next stage. My father in law died on September 26 2014, very early in the morning. My husband received the call, and I knew straight away what it was. We had not had much contact with him for a few years, but early morning calls never bring good news. My husband, Agus, immediately called all 7 of his brothers and sisters to give them the news, and went in to action mode. We were the only family members in Bali at the time, so it was up to us to deal with all the details. There was no time for emotion, as we had to be practical. We showered and dressed and rushed to the village, to let the head of the village know what had happened. He informed us that there was a big temple ceremony taking place, so performing a cremation was not allowed, and would not be possible for several months. We had a couple of cups of coffee, and discussed our options. We could rent a space in the morgue to keep the body, or bring it home, and keep pumping it with formaldehyde for who knows how long, or we could perform a cremation at a crematorium. We decided this would be the easiest way to go, but promised that we would do a formal ceremony in the village once the temple celebrations were over. We arranged for the ambulance to bring my father in law’s body to the crematorium, and had a small, intimate ceremony there, and then went out to sea to spread his ashes. In my mind that was that. Now, here we are eight months later, and the village is insisting on a formal ceremony. So yesterday we went out on a boat with a priest to call my father in law’s soul back for the ceremony. All the brothers and sisters arrived last night, and tomorrow is the big day. For the Balinese, their lives revolve around their religion, and ceremonies play a very important part. There are several milestones marked during a Balinese person’s life, from birth, 42 days, 3 months, 6 months, tooth filing, wedding and then the most important one is the funeral. It is believed that the soul cannot rest in peace if there has not been a proper ceremony. That is why we are doing this. My father in law was well loved in the community, and they are eager to pay their respects. He was a very unconventional man, he did not fit the typical Balinese mold, but religion and ceremony was very important to him, so this is to honor his memory. “Bapak” was a very small, wiry man, who must have been at least 80 years old when he died. He could never give a straight answer about his age, which is pretty typical of the Balinese. They do not celebrate birthdays as we do.He had a cheeky grin and a great sense of humor. He was also a bit of a mad scientist, always experimenting, and among other things, he created perfume, organic pesticide and chocolate. He was great at ideas, and creating products, but not so good at the business side, and too trusting of the wrong people. He never put down deep roots, preferring to travel around, staying in various places around Indonesia. He married a Javanese Muslim lady, and they both continued to follow their own religions. Their 8 children were encouraged to find their own paths, and now 2 are Christian, 4 Muslim and 2 Hindu. It was therefore very easy for me to blend in with the mix. He welcomed me with open arms, and was a wonderful father in law. Bapak and I would sit and talk for hours, about anything and everything. It was him that helped take turns holding my babies at night while the rest of the house slept. He had a very calm manner and my kids felt safe with him. I miss his gentle nature. Towards the end of his life, he grew restless, and went to live in the North of Bali, which meant we did not see as much of him, and were not there when he died. Tomorrow will be our chance to give him a proper send off. Eight months had passed since my father in law had gone over to the other side. We had already cremated the body, and scattered his ashes in the ocean. However, the formal Balinese ceremony had not been performed, so here we were, on a small fishing boat, bobbing up and down on the ocean, trying to summon his soul back, in order to have him present at the ceremony. We had a priest in the boat with us, who rang his bell intermittently, and chanted his incantations in to the wind. Just being in the presence of a priest gives me goose bumps, and the thought that he was conversing with my father in law’s soul had my whole body tingling. Besakih Temple, is known as the “Mother Temple” in Bali, and is the sight for many pilgrimages. It is said to be the only temple where a Hindu of any caste can worship, and therefore attracts thousands of worshipers daily. It has also become one of the many tourist attractions on the island. Over the years that I have been living in Bali, I have seen a steady commercialization of all things Balinese. I understand the incentive, its a great money earner, but at what cost? Every tourist attraction becomes swarmed with hawkers, trying to cash in on the tourist dollars. This is an inevitable side effect of a tourist destination, but should this really extend to the temples? Besakih temple is a particularly spiritual setting, located on the slopes of the majestic Agung mountain, it has an extremely commanding presence. I have only been once, but the memory of my time there is still extremely vivid. It was within the first year of being in Bali. Everything had moved so fast, getting married, trying to learn about the language and religion, and coming to terms with living so far away from home. The initial honeymoon period was over, and we were finding ourselves butting heads. My husband suggested that a trip to the temple would be good for us. I was not particularly keen, as it involved a long car journey, dressed in a corset and temple gear. Not the most comfortable clothing, I can tell you. The experience I had that night would not have been the same if this temple was allowed to be overrun with tourists. I have read comments of foreigners, complaining that they could not go in to all sections of the temple, due to them being restricted for worshipers. Well, think about it, imagine if a group of Japanese tourists came in to your church, and started taking photographs and ogling at you while you were in the middle of a service. It would be completely inappropriate, and the same applies here. There are some things that need to be kept sacred. So, please Bali, do not sell yourself out to commercialism, at least keep your places of worship tourist free. Bali is just one of 16,000 islands in Indonesia, and is the only island that is predominantly Hindu. The Balinese people are fiercely proud of their religion, and it plays a very important part of every day life. When they cook in the morning, a small token of the food is taken and offered up to the Gods, on a small banana leaf, and placed in front of the house. Later in the day, flower offerings are placed at certain points around the house, and blessed with water and incense. This is done every single day, by the females in the household. the only time they will not do it is when they are mensruating, and then one of the men will take her place. I have also taken on this role in my household. I enjoy taking time to go through the routine every day. It’s very peaceful, and although I am not deeply religious, I like that I have this time to contemplate on my day, and give thanks for what I have. It’s a very gentle religion, it is never forced on anyone. The ceremonies are happy occasions, bringing the villagers together, in peace and harmony. We have just celebrated Nyepi, and it is such a wonderful day, where we can reconnect, without outside distractions. I spent a lovely day with my family. Playing together, eating together and generally enjoying each other’s company. the next day we all felt refreshed and peaceful. So it was a shock to see a fellow Indonesian man using social media to rant about how awful Nyepi is because he could not watch his favorite football team play on TV. The Balinese are understandably upset, especially as it is coming from a fellow countryman. Indonesia prides itself in being very tolerant of all religions. So this goes against everything the country stands for. Being the peaceful people they are, they will not take action against this man. However, he needs to take a good long look at his own priorities and think before he speaks next time. 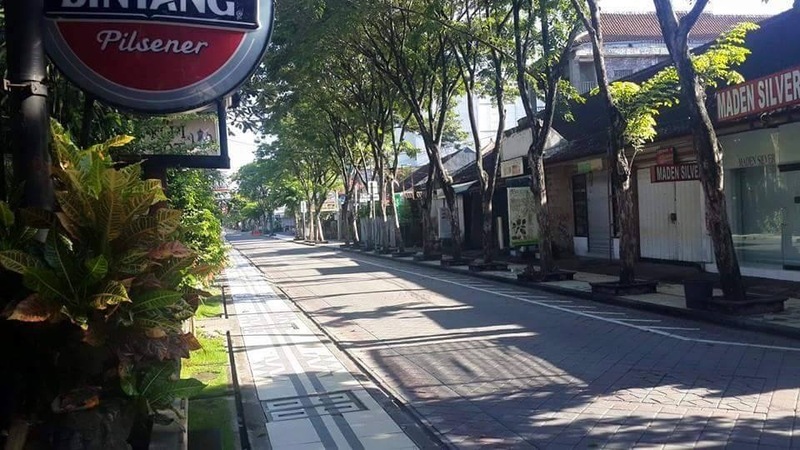 Here are a couple of shots of the empty streets in Bali today. I did not venture out to take these, as we are not allowed out of our house. But, there are some local “pecalang” that have the job of patrolling the streets to make sure no one goes outside, and they took these photos. Its pretty amazing, and hats off to the Balinese culture for maintaining this ritual every year, despite the amount of money lost from closing down all the ports. This proves that their strong beliefs are more important to them than money. I think we should all take a look at our own priorities. I am certainly enjoying slowing down, and living in the moment. I have my family here, all forced to be together, rather than everyone doing their own thing. We are playing games, chatting, and appreciating each other. By simply stopping for 24 hours, this island is reducing carbon dioxide emissions by 30,000 tons, and by not using electricity it is reducing the electricity consumption by 60%, saving around 290 megawatts of power. Amazing, just think if every country all around the world did this just one day a year!! Its really not that hard. Last night was the ogoh ogoh parade, where papier mâché monsters are paraded through the streets and then burned to release the evil spirits lurking inside. The Balinese spend months creating these creatures and the details are truly spectacular. It almost seems a waste to burn them. However to not burn them would risk keeping those evil spirits alive, and we really do not want to risk that. Superstitions run high here, and I have seen enough to know that these things are very real. It’s the day before Nyepi, and everyone has been stocking up on food. It’s crazy really, it’s one day, but the way people are behaving you would think it is at least a week. So we have our food supply, and bag of games to play, and we are ready for the day ahead. We went out this evening to the beach to see the sunset, watched the ogoh ogoh parade, and are now home, where we will stay for the next 30 hours. 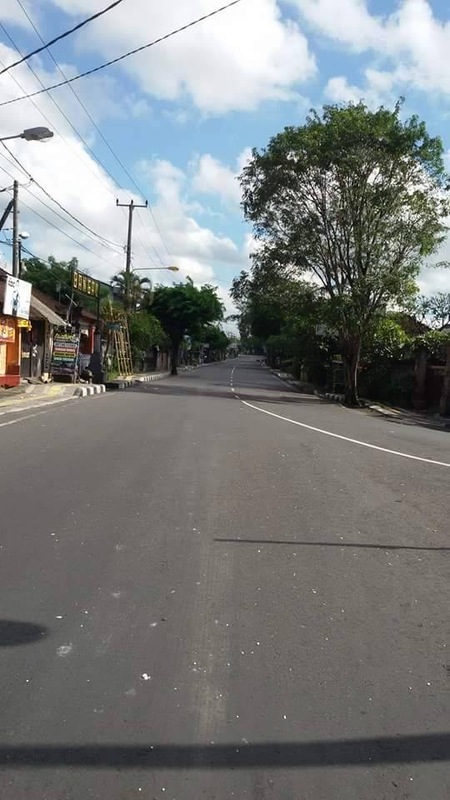 It’s a yearly tradition, where the whole of Bali shuts down for 24 hours, the airport and shipping ports are closed, there is no traffic on the roads. Everyone stays in their houses, quietly, with the lights off, meditating, or in our case, playing games quietly. It’s a time for reflection, and to bond as a family. I love it, and think he rest of the world could learn from this tradition. 2. A Melasti ceremony is performed three or four days before Nyepi day. This is when the Balinese all wear white ceremonial clothes, and walk in a procession to the sea, bringing various religious items to be cleansed in the water. They also will cleanse themselves, to get rid of any bad influences, and thoughts. 4. Starting at dawn the next day, for 24 hours, everyone must stay inside, and not use any electrical appliances or fire. Traditionally, the Balinese will fast on this day, and spend much of the day in meditation.The streets are empty, and this is believed to trick the bad spirits in to thinking that everyone has disappeared. 1. There are no flights coming in or out of Bali for the 24 hour period. 2. You will not be permitted to leave the hotel grounds. Black out curtains will be applied to the windows in your rooms, to prevent any lights that you may be using being seen from the outside. 3. You will be free to move within the hotel grounds, but please be courteous and try not to make too much noise. Keep use of lights to the minimum. 4. If you have a medical emergency, please contact the hotel staff, and special compensation will be given for you to be escorted to a hospital.